Location: Grifid Vistamar Hotel is located in the northern part of Golden Sands on the beachfront and only 30 metres from the beach. The hotel offers clean comfortable accommodation in a friendly environment. 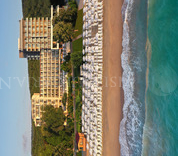 Accommodation: Grifid Vistamar Hotel offers single and double rooms with sea or park view and apartments. Each room has air-conditioning, balcony, direct telephone line, satellite TV, safe deposit boxes. Facilities: The hotel offers restaurant, lobby bar, outdoor swimming pool, pool bar, table tennis, two parking lots. Room service and elevator at guests' disposal. Water massage, sauna and medical centre available. For the business traveller Astoria Beach offers a conference hall. - Wi-Fi in the reception area. Services subject to additional payment: Safe on the Reception; Baby sitting, babyphone, baby stroller; internet; Water Sports, mini golf, tennis, parking; bicycle hire; billiard; SPA Center, beauty center; laundry.